Diamonds fans will remember Billy as a great, if rather controversial, goalkeeper. He started his career at Evesham United, and played against Diamonds in 1994 as they were pushing for promotion. He joined Northampton Town in July 1995, but in the four years he was with the Cobblers, he made a relatively small number of appearances and went out on loan to Leyton Orient in February 1998. He signed for Diamonds on 14 June 1999 for a £120,000 transfer fee after falling out of favour at Sixfields. Although Billy originally proved an unpopular choice by manager Talbot, the fans soon realised what a good goalkeeper he was. Billy had fantastic agility and had a commanding presence in his own penalty area. In 2001, he helped Rushden achieve league status for the very first time and was named player’s player of the year. He was also part of the side that won the Division 3 title and promotion to Division 2 in 2003. However, his 5-year spell at Rushden and Diamonds ended unceremoniously as he failed a routine drugs test after a match in December 2004. On 22 February 2005, the FA issued him with a 12month suspension, six of which were suspended for two years, plus a £300 fine, and he was subsequently sacked on 25 February 2005. Following the end of his ban he was snapped up by Oxford United. Billy’s time at Diamonds brought as many high points as it did lows. However, despite off field trouble, Billy produced consistent displays in goal for Rushden and made some 253 appearances for the club. 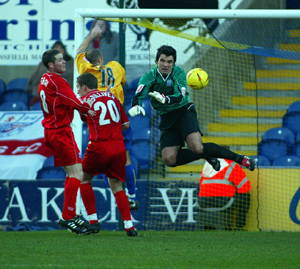 Billy remained with Oxford United for five seasons, although after four years as the No.1, he spent most of his final year at the Kassam Stadium on the bench. 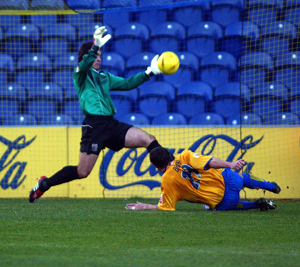 After over 170 appearances for the U’s, he was released at the end of the 2009/2010 season, joining Southern League Premier side Brackley Town on 29 May 2010. After more than two successful seasons with the Saints, it was announced on 11 October 2012, that the 40 year old keeper had left the club by ‘mutual consent’, but rejoined again ten days later after a truce with the manager. After a further season and a half with the Saints, Billy was released by the club on 4 June 2014 and retired from the game.